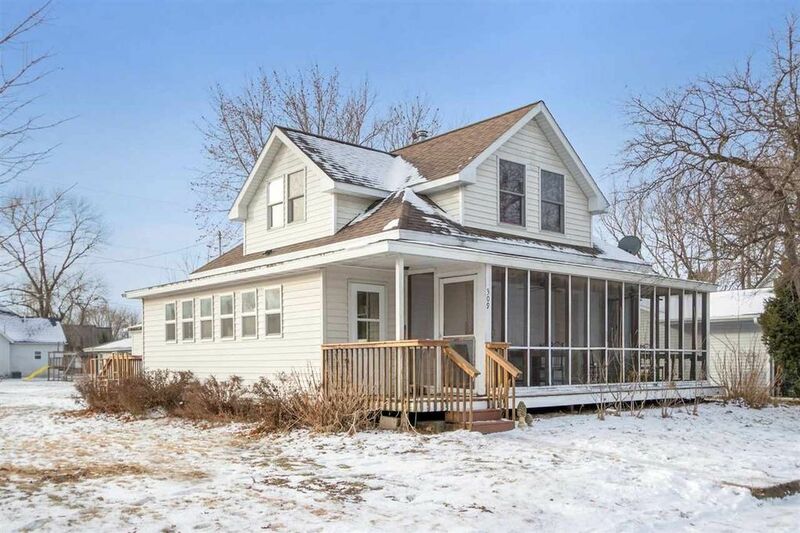 Tremendous opportunity to own this charming home in Hills, IA - where "town and country meet". A place where you can enjoy a small town feeling yet be close to everything. The master bedroom is currently on the main level but the upstairs could easily be made into a spacious master suite with a loft area, full bathroom and great built-in storage. The main level has tall ceilings, newer laminate, carpet & vinyl flooring, vinyl Pella windows, roof and light fixtures. The eat in kitchen has a new sink and comes with a microwave, stove, refrigerator and the washer and dryer stay too. There is a screened in porch to relax and enjoy the evenings on and a 3 seasons room with a built-in bench and more storage. This home has a reverse osmosis system, a dry basement and a newer water softener. It also has a large yard with a convenient fenced in kennel area behind the 24x24 double garage which has alley access, a concrete floor and an automatic opener but is in "as is" condition. The house is on city water however the outside well is still hooked up so you can water the established plantings and garden area guilt free. Close to the bus stop and local elementary school. Directions: US-218 South to Hills exit. Turn East onto Observatory Ave which turns into Main Street. House is on the South side of the street.